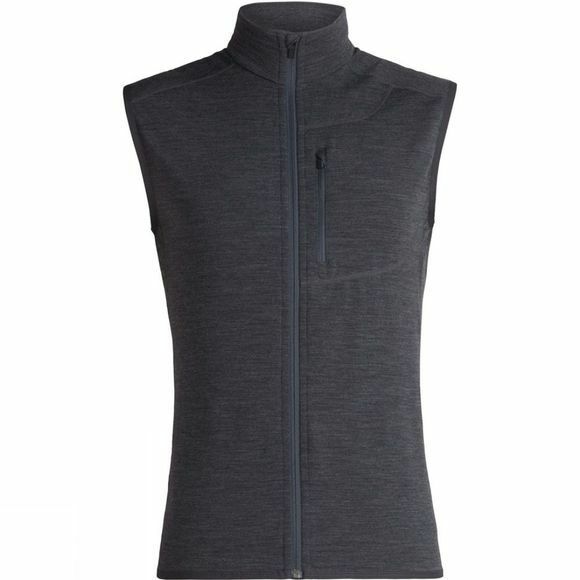 Designed to keep you moving without any restrictions, Icebreaker Men's Descender Vest is perfect for those cool missions on the hills or the trails. A high-loft brushed back with heat-trapping channels allows your temperature to regulate and the lighter side panels helps to remove moisture away from your body. Its own zippered chest pocket is the perfect place for storing those small essentials, whilst on the move. Icebreaker has been pioneering the use of merino wool in technical clothing since its birth in 1994. The merino is one of the world’s most ancient breeds of sheep, favoured by manufacturers for its tough but incredibly soft wool. Using cutting edge construction techniques, Icebreaker has adapted the wool into a system of layers ideal for the outdoors, performance sports, and the city. Sustainability is at the heart of what Icebreaker do. They're not bothered with creating the latest technical fibre for their garments; nature has already created the perfect natural protection against scorching summers and freezing winters. By putting the environment before profit, Icebreaker have created a profitable sustainability through a balance of ecology and economy. Icebreaker merino garments are soft and non-itch, warm in the cold and cool in the heat, extremely breathable, and have a miraculous ability to warn off odour. Icebreaker have adapted merino wool into a system of lightweight layers. Wear a next-to-skin layer in warmer weather, then layer up for insulation in the cold.